A hog-tie is used in tie-down or calf-roping rodeo events. In such an event, a cowboy on horseback pursues and ropes a calf. The cowboy dismounts and flanks the calf, putting it on its side on the ground. 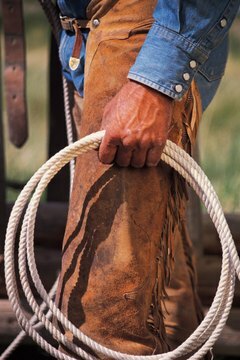 The cowboy then secures together three of the calf’s legs with a rope, using a half-hitch knot. The securing of the legs is called a hog-tie. This timed event is featured in rodeos, and its history can be traced back to working ranches where cowboys had to catch and immobilize calves for branding or medical treatment. Rope the calf from horseback. securing the rope to your saddle horn. Dismount and sprint towars the calf while holding the pigging string in your teeth to keep your hands free. A pigging string is a short, looped rope used especially for tying the calf’s feet. Throw the calf to the ground by placing your knee against its side and using your arms to lift the calf off its feet and push it over on its side. This maneuver is called flanking. Place your knee on the calf’s side, securing the calf on the ground using your weight. Grab the front leg nearest to your body and slip the pigging string loop around the calf’s leg, placing the loop a few inches above the hoof. Pull the rope to tighten the loop on the leg of the calf. Collect the calf’s two back legs using your other free arm and pull them up near the front leg that is secured by the pigging string. Hold all three legs as close together as possible. Grab the tail end of the pigging string and loop the string around all three legs. Continue to loop until the string has circled the legs three times. After the third loop, secure the tail end of the pigging string by pulling it through the center of the loops. Pull the tail end of the string tightly to cinch the legs together and secure the knot, completing the hog-tie. Securing the rope prevents the calf from being able to kick free. Successful hog-tying depends greatly on the teamwork between the cowboy and horse. Once the calf has been roped and the cowboy dismounts, the horse must continue to move backward to keep the rope from becoming slack without pulling the calf off its feet. Hog-ties are also known as “hooeys” in the rodeo circuit. Hog-tying should be completed as quickly as possible to limit the amount of stress placed on the calf. Allison Travis has worked in the association management industry for 10 years with a focus on desktop publishing for associations. She has contributed to the "Quality Assurance Journal," "Quality Matters" Newsletter and numerous other association industry publications. Travis graduated from the University of Virginia with a B.A. in English.